Head, shoulders, knees, and toes...and antennae, and wings, and beaks, and paws. year two life science introduces young kids to the many kinds of life around them. Get your first grader ready for life science learning with our collection of year two life science worksheets, covering everything from body parts to plant growth. This cute worksheet asks your first grader to write down each part of the human body--encouraging research on life science and boosting his spelling ability! Use your knowledge of the animal kingdom to help these baby animals find their way home! Plants need to breathe and eat food (energy) just like us! Help your budding naturalist to learn about photosynthesis. Challenge your first grader to put these plant life cycle stages in the correct order with this fun beginning biology sheet. 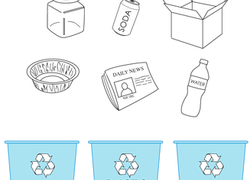 In this recycle worksheet, kids colour the different recyclable objects, then match them up with their corresponding bin. Try our recycle worksheet on Earth Day. 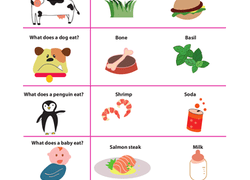 What does a dog eat? Kids choose the pictures that show what kind of food each animal likes to eat in this year two life science worksheet. Explore the different body coverings of animals with this fun coloring page. Who Belongs in the Desert? Which of these animals does not belong? Explore the plants and animals of the desert, and choose which ones are in their right habitat. Explore the circle of life with this informative coloring sheet! Help your student colour and learn the names of each stage of a frogâs life. Decide what differentiates living vs non-living things! First cut out the items on page 1, and then sort them in the chart on page 2. This dot to dot page features giant Barosaurus, a dinosaur with a very, very long neck. Celebrate the coming of spring and with a daffodil coloring page, complete with a diagram so your little blossom can learn the parts of a flower as she colors! Learn more about how plants work with this cool celery experiment! Use this worksheet to help you record your observations after doing this experiment. Can you tell which things are living or non-living? This is a great way to introduce kids to animal and life sciences.